Pastry making should be a mandatory school subject ! It involves chemistry, math, art, some equipment, patience… But above all there is a lot of love in the process ! What would be the reason to spend so much time making something if not to make people around you happy ? Easter is coming up and as promised I am sharing my recipe for a four-layer cake, which I myself am planning to serve my family. With every bite you will have a combination of a very soft, not at all gluten-free tasting, cake, smooth dairy-free pastry cream, and refreshing raspberries. This is one of the many instances when I am truly sorry that I cannot have you, my dear neighbors, over to taste this festive dessert which involves several steps, but is not in itself that difficult to make. All it requires is a little organization, and trust me, if I managed it, you can too. Sorry for writing some lengthy (boring?) explanations but I wanted to make this tutorial as clear as possible. Hopefully the photos I took when I last made it, back in February, will help too. – 15 g (0.5 oz) organic tapioca starch + 1/2 tsp agar-agar, both necessary for the right consistency : you do not want a runny cream in this type of cake. * How to make icing sugar : just run your natural cane sugar through a food processor or coffee grinder. 1. 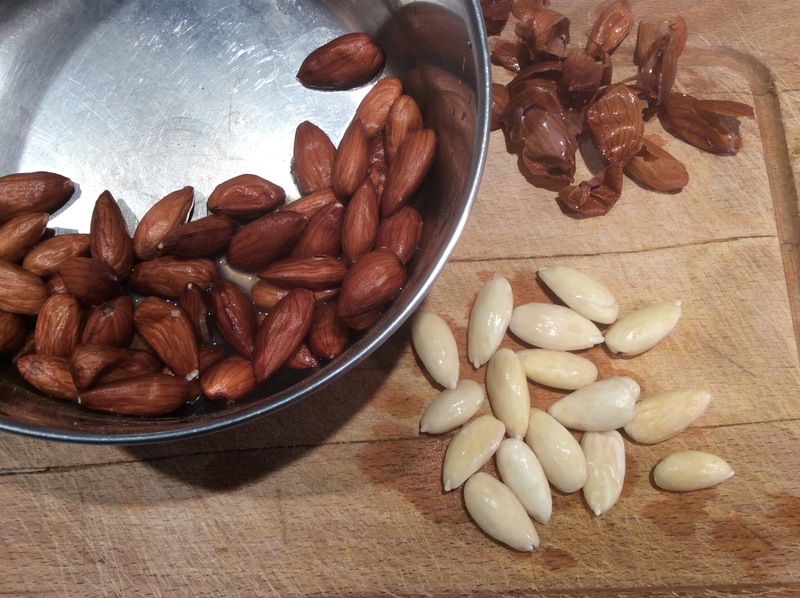 Bring the almonds to boil in a pan with water and let rest for 5 to 10 minutes. You will then be able to peel them very easily. 2. Preheat your oven to 170°C / 335°F (fan-forced) or to 190°C / 375°F (conventional heat). Coarsely chop the peeled almonds, by hand or in a blender. 3. Spread almond pieces on a dish and bake for 8 to 10 minutes, keeping an eye on them and stirring them gently once or twice so as to get a pretty golden color. Remove and keep in a tightly closed glass jar once completely cooled. Resist the temptation to use them as a snack before the cake is made !!! For a traditional French pastry cream, gluten-free and dairy-free, follow my instructions here. … just combine the ingredients listed above, beat everything together until well blended ! 1. Trace out two 30 x 15 cm (12 x 6 inch) rectangles on 2 separate sheets of lining paper with a marker. Flip the paper over and fold it on each side about one centimeter (1/2 an inch) away from traced rectangles. This will make a paper case and ensure that your cake batter will not spread too much. You do need the extra space to make a clean cut before assembling the cake. Grease the paper up to the folds. 2. Preheat the oven to 185°C / 365°F, if fan-forced, or up to 200°C / 390°F, if using conventional heat. 3. Beat the 4 egg yolks with the 100 g (3.5 oz) icing sugar until batter becomes lighter in color and a « ribbon » forms when lifting a spatula. Beat egg whites until peaks form. If you own a stand-alone mixer, this can be done while you are tending to the yolks and sugar batter. 3. Add in the 60 g ( 2.1 oz) flour and 40 g (1.4 oz) almond meal, mixing well, then gently fold in the beaten egg whites. Weigh the bowl again (weight b) and calculate the weight of your batter (weight b – weight a). 4. Place one of the greased « paper molds » on a baking tray and pour half the batter as evenly as you can, with the help of a rubber spatula. Bake for about 6 minutes. Remove and flip the baked rectangle on a wet (and clean ^^) kitchen towel. Peel off paper. Repeat with the rest of the batter. 5. Moisten each baked layer with sugared water, using a spoon, then cut out two 15×15 cm (6×6 inch) squares from each one. You now have four equal cake layers. 1. Place a first layer on your serving plate. Lightly brush with coulis, if desired. 2. Spread as evenly as possible with 1/3 of the cream filling of your choice (90g of my pastry cream), then add as many raspberries as you want. Keep in mind that you need them evenly placed, especially along the edges : they will serve as pillars for your next cake layer. Now we’re talking architecture too ! 3. Place a second, then a third layer repeating step 1. 4. Place the last layer on top ; it’s time to make the icing. Mash a few raspberries in a sieve in order to gain 1 TBSP juice. Add 75 g ( 2.6 oz) icing sugar and stir with a spoon. Spread on the top layer of the cake ; using a long pastry spatula makes the job easier. Don’t worry if it isn’t as pretty as you would like it. 5. Finishing touch, almost there ! Put the toasted almond pieces around your cake and cover all sides pressing them up with a spatula or the back of a big spoon. You should have more than enough and can use any leftovers to sprinkle on top of your cake… and maybe cover any imperfections ! Congratulations, you have just made a beautiful cake ! Keep in the refridgerator until serving time, protected by a big bowl (I use a plastic strainer) placed over it. 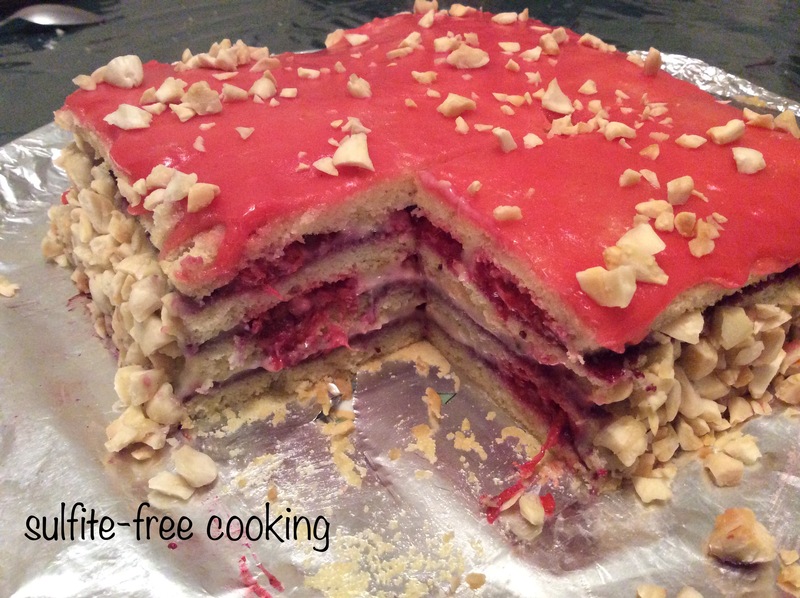 Adding the coulis makes the different layers appear more neatly when you cut through the cake. Fantastic cake! And I totally agree with you about pastry-making in schools. In fact, when I ran the school, we had cooking and baking days once in a while, and in camp I did International Food Festivals every week. In addition to math and science, it develops social skills. Thank you, dear Joelle, for yet another great recipe! Thank you for being so supportive, Dolly 😊! This neighbour is overawed, that looks incredible and the recipe is so clear and precise. There isn’t a hint of maundering anywhere. It must’ve tasted delicious, but perhaps it’s best all your dear neighbours couldn’t show up, it’d be hard to get rid of us after we’d tasted your amazing baking! Thank you for making me laugh! Yes, it was a big success, especially with my cousin’s teenage son who was sorry there wasn’t any more… But at his age anything sweet tastes good, right? I am looking forward to making it again for my next guests. I’m still recovering from my teenagers years spent indulging my sweet-tooth! If only I knew what I know now, which still isn’t much, but at least I know to lay off the cake. Those are some very lucky guests, I hope it’s appreciated, dear reader!